The idea that the crusades were a response to Islam dates back as far as twelfth-century historian William of Tyre, who began his chronicle with the fall of Jerusalem to Umar ibn al-Khattab. Although the original Islamic conquests took place centuries before the First Crusade, there were more recent events that European Christians still remembered. 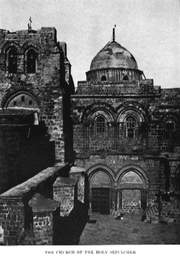 In 1009 the Church of the Holy Sepulchre was destroyed by the Fatimid Caliph al-Hakim bi-Amr Allah; Pope Sergius IV supposedly called for a military expedition in response, and in France, many Jewish communities were even attacked in misplaced retaliation. Nevertheless, the Church was rebuilt after al-Hakim's death, and pilgrimages resumed, including the Great German Pilgrimage of 1064–1065, although those pilgrims also suffered attacks from local Muslims. In addition, the even more recent Turkish incursions into Anatolia and northern Syria were certainly viewed as devastating by Eastern Christian chroniclers, and they must have been presented as such by the Byzantines to the pope in order to solicit the aid of European Christians. The Church of the Holy Sepulchre (Latin: Sanctum Sepulchrum), also called the Church of the Resurrection (Greek: Ναός της Αναστάσεως, Naos tis Anastaseos; Arabic: كنيسة القيامة‎, Kanīsat al-Qiyāma; Armenian: Սուրբ Հարություն, Surp Harutyun) by Eastern Christians, is a Christian church within the walled Old City of Jerusalem. The site is venerated by most Christians as Golgotha, (the Hill of Calvary), where the New Testament says that Jesus was crucified, and is said to also contain the place where Jesus was buried (the sepulchre). The church has been an important pilgrimage destination since at least the 4th century, as the purported site of the death and resurrection of Jesus. Today it also serves as the headquarters of the Greek Orthodox Patriarch of Jerusalem, while control of the building is shared between several Christian churches and secular entities in complicated arrangements essentially unchanged for centuries.